Web Feet and Slimy Skin will be presented by Dr. Kris Hoffmann from the University of Maine, Kris spoke to us in September about turtles. 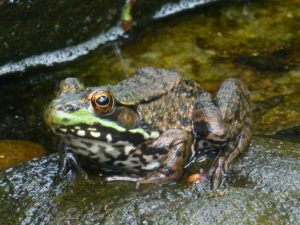 Her return promises a fascinating, informative, and funny program – this time on Maine’s fabulous frogs. Anatomy meets ecology in this hour-long presentation. Join us as we learn why frogs are slimy, how metamorphosis affects more than their legs, where they go in the winter, how they use their eyes to help swallow, what you can do to help their populations, and more. 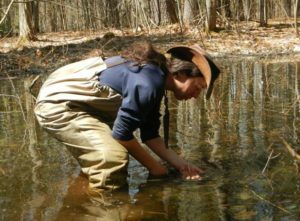 She will describe the biology of these water-loving animals, introduce us to all the frogs in Maine, and discuss their conservation in a presentation sure to entertain! The program will be at 7 p.m. in the Mather Auditorium at the Wells Reserve at Laudholm. This interesting, educational program is free and open to the public. Come early for refreshments.